Along with our dentist Dr Stephen Suster, the team at our Menai family dental clinic has years of experience in oral health care. Together, we strive to make your visit to Vision Dental one that’s both enjoyable as well as informative. Natalie has a Bachelor of Oral Heath and Health Promotion from the University of Newcastle. Since graduating, Natalie has worked at various practices and gained experience in all aspects of dentistry. 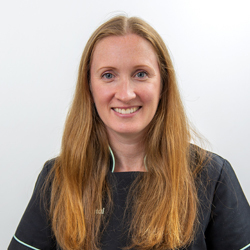 Dedicated to providing quality care Natalie continually educates and develops her skills, providing her with current practice knowledge and methods. She has attended courses in advanced periodontics, tooth whitening and many more. She is passionate and strives to make all her patient’s experience positive and comfortable; catering to their needs and providing them with the knowledge, motivation and skills to maintain their oral and general health. 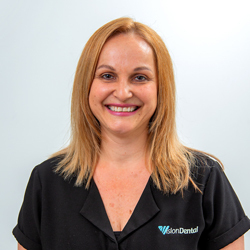 Natalie has worked at Vision Dental since 2011 and with her sincere, warm and caring approach has developed good patient rapport and continues to do so. Maxienne completed the Cert III in Dental Assisting in 1999, and has 20 year’s experience working as a dental assistant. She has been working with us since January 2017 and has lived in the Menai area for 12 years. 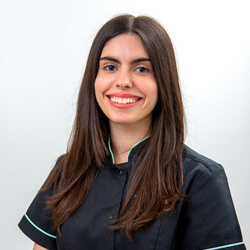 Maxienne enjoys using her experience to provide patients with high quality care, reassuring patients that they are in capable hands and making sure they are well looked after. When she isn’t working, Maxienne enjoys family time with her husband and five children, and likes to relax watching her favourite shows and movies on Netflix. 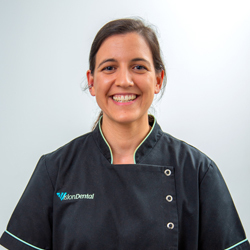 Yolenda Coelho has over 10 years experience in the dental industry. She has a warm friendly nature and enjoys interacting with our patients. Yolenda has been with us since October 2014, and has lived in the Menai area since 1998. Prior to joining our team she was “a stay at home mum” for six years. Even though her four children kept her very busy, she felt it was time to re-enter the workplace in a stimulating and productive environment. Outside of work Yolenda enjoys watching her children play sports, dining out and spending time with her family and friends. Andrea moved to Australia from Uruguay five years ago. 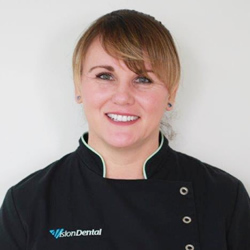 She has a bubbly & friendly personality and fits in well with the Vision Dental team. She has two years experience as a dental nurse, she also has a Certificate in Accounting in both Australia and Uruguay. Andrea’s favourite aspect of working at Vision Dental is taking care of her patients and helping improve their general dental health. In her spare time, she enjoys reading, relaxing and spending time with her dog and family. Karen grew up in the Eastern Suburbs of Sydney and currently resides in the Illawarra. She has over 7 years of experience as a Dental Assistant and Travel Consultant with many other years of employment serving the community. Karen is a good communicator, relates well to others, has an empathetic nature, striving to make all patients comfortable and relaxed in an environment that can often make people feel apprehensive & anxious. Outside of work Karen enjoys spending time at home with her husband, Willow (their dog), family, and friends. She also enjoys cooking and reading. Contact our Menai dental clinic today to schedule your next visit with us. Same-day appointments are available!